Tiger sharks, or Galeocerdo cuvier, are among the largest species of shark. Tiger sharks are one of only a few shark species that change skin patterns and body forms throughout their stages of growth. Tiger sharks get their name from the stripe-like patterns on the young sharks' skin. 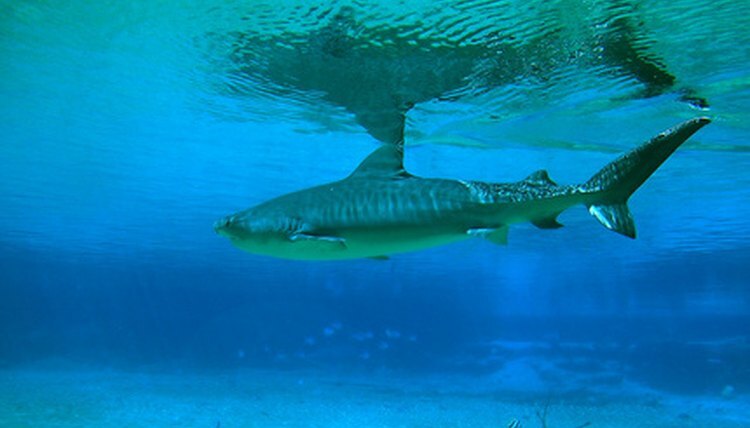 Female tiger sharks are pregnant with their young for about one year and three months. Female tiger sharks usually give birth once every three years. The female can give birth to an average of about 40 babies, though this can range anywhere from 10 to 80 babies in a litter. Tiger sharks are usually about 20 to 30 inches in length at birth and are very skinny. The baby tiger sharks are born with striped patterns on their skin which fade as they grow. The baby tiger sharks are not taken care of by their mother. Young tiger sharks, unlike adults, have spotted patterns along the length of their bodies. As the tiger sharks grow, these spots become elongated, eventually taking on a stripe pattern. Young tiger sharks often remain close to shore and their spotted markings help camouflage them as they appear similar to shadows beneath the water’s surface. Adult tiger sharks can measure up to 7 meters in length, though they average about 5 to 6 meters in length. Tiger sharks do not reach sexual maturity until they are about 5 years of age. It is estimated that tiger sharks live to be about 12 to 20 years. Young tiger sharks feed on a variety of aquatic animals such as sea turtles, fish, squids, birds, and seals. As the tiger sharks grow in size, so does the size of its prey.